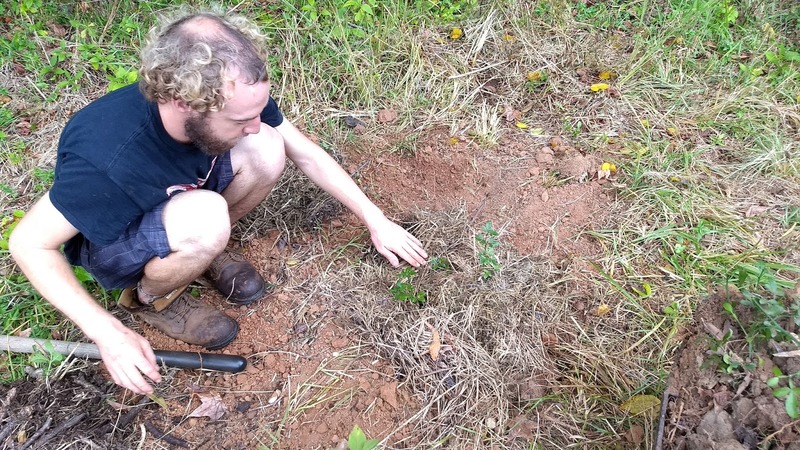 Understanding soil conditions is key to planning a reforestation project, knowing which plants will grow and which amendments may be needed. The following 5 tests use simple, universal methods. Data from these tests can be entered in this Google Form. pH - With soil samples mixed with water, add vinegar or baking soda. Mixture will fizz from vinegar if alkaline, or from baking soda if acidic, or neither if neutral. Compaction - insert a metal hanger into ground and measure the depth it can penetrate. Permeability - Insert a pipe firmly into ground, fill with water and measure the rate it descends. <or> Dig a hole 12" (30cm) deep and 6" to 12" wide with flat sides, fill with water and measure the rate it descends. Composition - with a clear jar, fill half with soil and half with water, leaving one inch (2.5cm) of air. Cap, shake and let sit over night. Measure the separated layers of clay, silt and sand. Horizons - Excavate a soil profile to view soil horizons. Record each horizons depth, color, texture and composition. and overview of project at Modern Harvest. Good Post! Understanding and clearing the concepts of soils will help the people a lot with the plantation which is very much important for the people who loves to do the planting. Great info. Helped Me Alot. Keep Up The Good Work. Thanks for the comment. Glad it helped!